When I was in the Institute of Hawaiian Music we ALWAYS had a setlist for gigs. This is Axel Menezes and Adam Bediamol at a show. You’ve got a gig. Even better, you’ve got plenty of songs to fill the time! But if you don’t give any thought to what order you will play your tunes in, you are throwing away an opportunity to make a big upgrade to your set. Here are some things I like to keep in mind when I’m putting together a setlist. The first thing to keep in mind when picking your song order is where you will be playing. Are you the main act at a sold out theater or are you playing in the corner of a restaurant by the bathrooms? How they didn’t want you to stop because of #1. Don’t force yourself upon anybody, just start off playing a nice solid song like you own the place and don’t expect to get huge applause because of your song choice. From there you are the background music for the night. Hopefully they’ve turned off the Muzak and it’s all you. Your job is to keep the atmosphere going. Play medleys, play extended versions of your tunes, but no matter what you play, keep it appropriate in feel. Voodoo Child does not go well with candle-lit (leave the distortion pedal at home, kids). You can play longer stretches without stopping because most people don’t remember you’re there until you stop. Take a breather every few songs and sip some water to let the room settle, then go right back into it. Your outro should the same as the intro – solid, but with a definite ending to make it a bit more obvious that you’re done. Each song has a speed and groove. When putting together your setlist, try to make sure that your fast songs and slow songs are mixed fairly well. The last thing you want is for people to get bored by three really slow songs in a row or blasted out of the room by back-to-back rockers. Break it up and create blocks of excitement. Don’t always play fast song > slow song > fast song > slow song, but find songs that fit well together groove-wise, even if they aren’t the same speed. The goal is to create a flow so the audience feels the excitement when you play a brisk tune and then have a chance to relax as you play something mellow. If everything is one tempo and one volume all night, nothing has the chance to stand out. Use this technique to highlight songs you want them to pay attention to. If you play a medium-mellow tune and then a slow balled you are primed and ready to jolt them out the mood by kicking it up a notch. 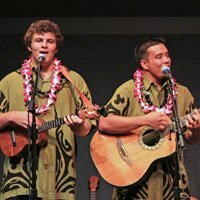 ‘Ukulele songs tend to be in keys that suit the instrument – C, F, G. That means you don’t have as many options for traversing the sonic families as a band with a wide varieties of instruments would. Make sure you don’t play all of your C songs back-to-back (even if they are great and at different tempos) because they will kind of start to sound the same. Medleys are cool and can be a great way to create continuity, but plan out where you want them to be. You don’t want to create a bunch of them accidentally by staying in the same key between songs and not giving yourself enough space between them. Unless you are intent on banging out a set as fast as possible or are doing an ‘ukulele symphony, you probably should talk during a set. Sad, but true for some of us who would really rather just stay silent. The audience usually likes to be able to relate to your music and by talking you can let them do that in a bit of a more personal manner. Even at a restaurant gig it is probably nice to (at least) introduce yourself and tell everyone you have CDs for sale. Don’t talk after every song – they are trying to eat, but you are there and you’re a person, so say something. Talking is another chance to let the atmosphere breathe. It’s a chance to thank the venue (if appropriate), introduce yourself/the band, a chance to show some personality, tell a joke, etc… It’s really too good an opportunity to be wasted, seeing all the great ways you can spin the audience with your words. That said, stage banter definitely takes some practice and I don’t have any magic tips yet to help you out. Watch how the pros do it and take notes. James Hill has some great stage banter. He always manages to get the crowd laughing in no time. Talking is almost always better than long silences. Kind of like a magician redirects his audience’s attention with where he looks, you can do the same with talking between songs while the drummer retrieves his sticks or while you try and remember the chords for the verse. If you did your job (especially in Hawai’i) they will call for a “Hana hou!” or “Encore.” Have one ready. If you don’t have one prepared it’s lame – straight up. They think it’s worth their time to sit and listen to you play another song! Honor that. Your list is pretty useless unless you have it onstage with you (or memorized). Open a word document and type it out. You really only need a word or two from the song title to jog your memory. (“Stairway” or “Robinson” will get you there just as easily as “Stairway to Heaven” or “Mrs. Robinson” if you know they are both somewhere on your list.) Page space is precious! Make the font as big as possible. You need to be able to see it from your chair or wherever you are standing. It might be worth making two pages if you have a really long set. You can also try making two columns. Now I’ve shared my tips, what are yours? There’s no one right way to make a setlist. Plenty of people don’t even bother creating one! What’s your approach?